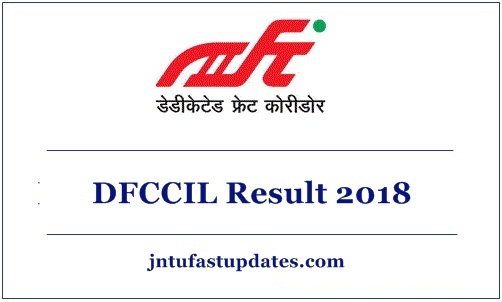 DFCCIL Result 2018 Online: Dedicated Freight Corridor Corporation of India Limited (DFCCIL) recently conducted the written test on 10th, 11th, 13th November for MTS, Executive, and Junior Executive posts. Many of the competitors seeking to get jobs in DFCCIL have competed for the written test round with a great ambition. Aspirants seeking to check the DFCCIL MTS, the Executive result will have to wait for few more days. The organization will soon announce the result date. Aspirants competed for DFCCIL posts can stay checking the official website dfccil.gov.in to download the result. The organization will also let the hopefuls to check their score obtained in the test, cutoff marks, and merit list. Hopefuls competed for the test can check the DFCCIL answer keys for MTS from the official website mentioned here. For more updates regarding the results, candidates can go through the following article. Dedicated Freight Corridor Corporation of India Limited (DFCCIL) is the central government organization that spread across many states in India. The organization annually announces various jobs to hire the eligible aspirants into various posts. The DFCCIL has recently announced various posts of MTS, Executive, and Junior Executive. It has announced 1527 posts for all the vacancies. The organization received many numbers of applications from the interested and eligible candidates from 1st August to 31st August. Lakhs of aspirants have applied for DFCCIL Posts. The screening will be done through the written test and interview rounds. All the candidates who have appeared for the examination can download the DFCCIL MTS, Executive, Junior Executive results shortly. Visit the official website, dfccil.gov.in for latest updates. The results are likely to release after 3 to 4 weeks after the examination date. Hence candidates have to stay patient until the organization announces the exact date of result. The DFCCIL will also announce the cutoff marks/qualifying marks for the conducted examination. Based on the cutoff marks candidates can check whether they have qualified in the examination or not. Candidates must score the required cutoff marks to qualify in the test. Candidates qualifying the examination will be sent for the interview round. By following the below-given process candidates can download the result. On the basis of written Examination held on 10th November, 2018 for the post of Executive (Civil), the following candidates have been provisionally shortlisted for Document Verification and Medical Examination. The candidates may please note that this should not be construed in any manner as an offer for employment. The names have been indicated in order of merit and as per availability of vacancies and extant reservation rules. How to check DFCCIL Multi Tasking Staff Exam Results 2018? Visit the official website dfccil.gov.in and go to carrers section. Now you will get results. 1.2 How to check DFCCIL Multi Tasking Staff Exam Results 2018? aur Sir cutt of kitni rahega. ..
sir plz can u let us know when we will be getting the result for executive (signal and telecommunication) ….